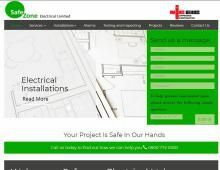 SafeZone Electrical are electrical contractors in Ealing, covering central London, Middlesex, Harrow and the surrounding areas. Providing comprehensive electrical services across London, SafeZone Electrical work with both domestic and commercial clients to satisfy all customer needs. If you’re looking for an electrician in Ealing, or across central London, SafeZone Electrical’s range of electrical services ensure that they will be able to meet your needs. This could include electrical inspections in Harrow, fitting emergency lighting in central London, electrical installations in Ealing, or electrical maintenance in London. As a commercial electrician in Ealing, SafeZone Electrical are also able to provide three phase electrician services in Middlesex and London. When you have an urgent problem, SafeZone Electrical are available 24/7 when you need an emergency electrician in Middlesex or London. So if there is an urgent issue and you need an electrician in Ealing, Harrow or across the Middlesex and central London areas, contact SafeZone Electrical any time for emergency electrician services. Whether you need domestic or commercial electrical services in London or Middlesex, contact SafeZone Electrical today for a free quote.